Roasted Pumpkin Seeds Two Ways - Eat. Drink. Love. I was a little hesitant to post these recipes since now that Halloween is over and most of you are probably done digging into pumpkins, but you know what? Pumpkin season is not over! So, for those of you who are still planning on cutting into pumpkins (or butternut squash!) for your cooking and baking needs, this is for you! After carving our massive pumpkins, I had a good 4 cups worth of pumpkin seeds. Since we already had enough sweets in our house, I didn’t want to make these sweet, so I hit up my spice cabinet to see what I had. Since I had so many pumpkin seeds, I figured it would nice to try more than one recipe, so I made two different kinds: Rosemary Garlic and then Spicy! For both recipes, I recommend that after rinsing them, lay them in a single layer on a towel to dry over night. 1. Preheat oven to 275 degrees. Line a baking sheet with parchment paper. In a bowl, add the pumpkin seeds and then all of the other ingredients. 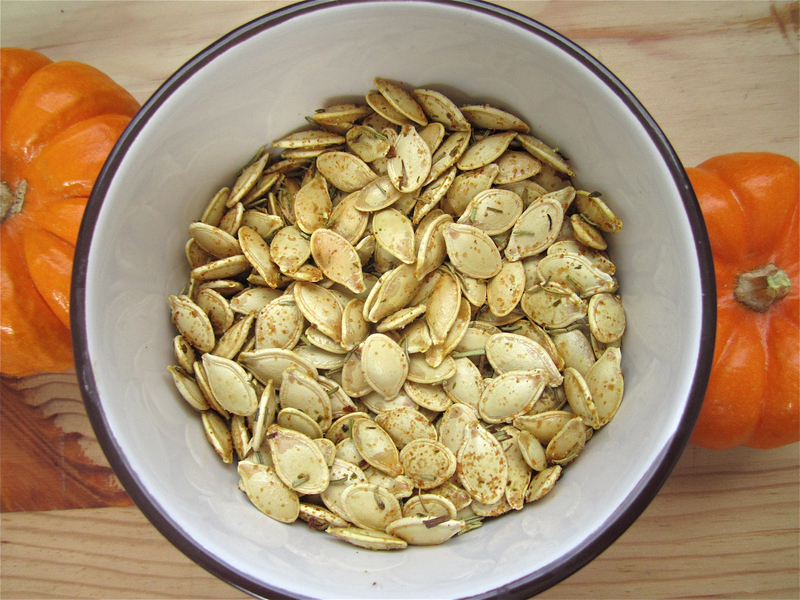 Stir ingredients together until the pumpkin seeds are well-coated. Spread onto an even layer on the baking sheet and bake for about 45 minutes, stirring the seeds with a spatula every 15 minutes. Sadly for me, pumpkin season skipped us this year because pumpkins are very pricy here, but I would have loved to try either of these recipes even after Halloween. I think I would like the spicy one best, because I just like anything spicy. Can you roast butternut squash seeds the same way as pumpkin?!?! If so, I’ve seen some reasonably priced ones, and I just may try that. Great post! thank you for reminding me that pumpkin season isn’t over yet. i was bummed that i missed out because i didn’t carve a pumpkin for halloween- but that doesn’t mean i still can’t have pumpkin seeds! Thanks for the GREAT options! I’m going to pull my pumpkin apart and roast in a few days…. Super ideas! Love rosemary and garlic! I’ll have a bowl of the rosemary garlic, please. Both varieties look wonderful. I have to admit, I have always thrown out all of the seeds. That doesn’t mesh well with my so-called frugal image, so I will have to fix that next year! I like the idea,,,i can smell that garlic and rosemary,,,yum !! I will gladly have both of them-yum…nothing like roasted pumpkin seeds. Thanks for sharing these two delicious options for a great snack! I’ll take the rosemary garlic thank you! I so needed this recipe a week ago. We were going to roast some pumpkin seeds and I didn’t have a good recipe. Well, I’m saving this one for the next time I have a fresh pumpkin. Looks yummy! Brillant!! Rosemary and garlic…love it!! Ooh, I don’t know which one of these looks better! Oh yum! 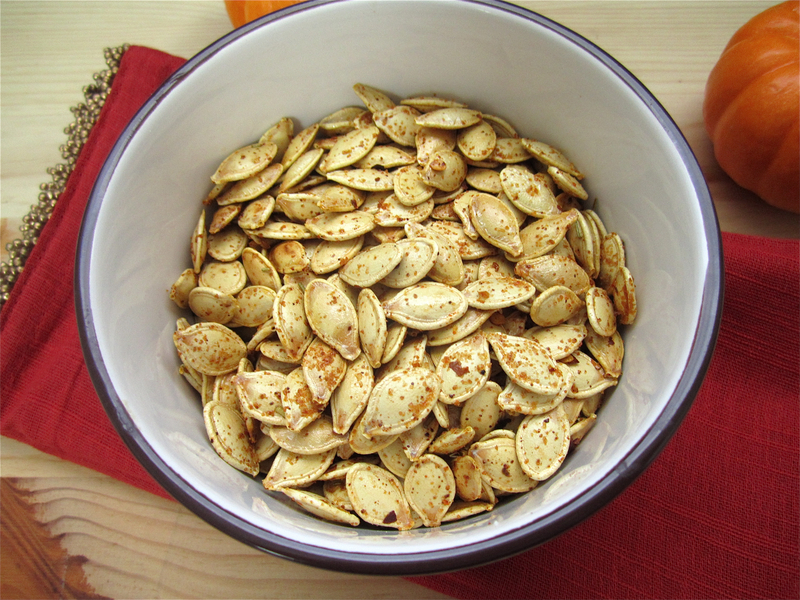 I think roasted pumpkin seeds might be my favorite snack of all time. Great flavor ideas, thanks for the inspiration! Pumpkin season is not over till Thanksgiving has come and gone. Then we jump right into cookie season right? The one with rosemary are great to add to my salad, love it!!! I’m so glad to see these! I feel like everyone is jumping right into Christmas foods and I’m not done with pumpkin yet! Never hesitate to post a pumpkin recipe! I’ve heard pumpkin seeds are super healthy. My husband is a big fan. Love that you did it two ways. This is delicious! In Cyprus we call them “passatempo”! You’re absolutely right, pumpkin season is not over – you go girl! Rosemary is a favourite (especially when accompanied by sea salt) and I also love the heat coming off the cayenne – wonderful! I like Emily’s comment. I second it! Totally bookmarking this! The spicy ones were my favorite! I love roasting pumpkin seeds. Never too late for a good recipe! I think the spicy ones look right up my alley! Plus, I make a lot of recipes that I top with pepitas and I think these would be an interesting twist. Thanks for the post! 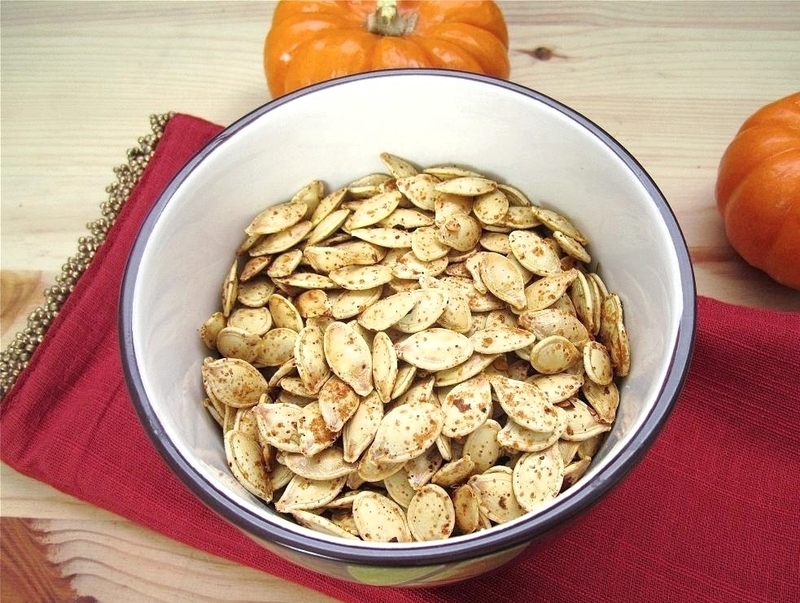 I love roasted pumpkin seeds and would probably devour both of these variations. As long as I have pumpkin in my pantry there will be pumpkin seed season and those rosemary garlic ones are calling my name!